Etana is the new sensation dominating the airwaves in Jamaica. This twenty three year old artist has been embraced in Jamaica and abroad. Fifth Element Records, behind Richie Spice and Chuck Fender, helped her produce a string of hit singles that have been riding long and strong on the charts. She is young and bright, with a powerful voice and good songs. Etana is rising fast. ETANA Reggae music has birthed yet another rarity- a spirited and soulful singer/songwriter in the eloquent and enchanting empress Etana! In just one short year, Etana has been hailed as one of the burgeoning new and sensational sounds in the roots Reggae era. That she is a young woman, a small one at that, in a largely male-dominated industry is even more surprising. 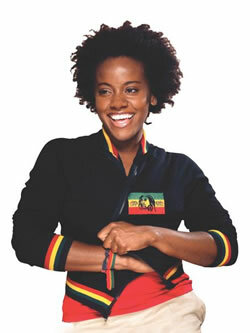 Her debut single, Wrong Address, co-written with Sean Element, and released in the spring of 2006, has created waves throughout the Reggae music scene. The recognition is attributable to her unique and expressive vocals which envelope the song, as well as the song’s lyrical content. To catch her in performance is to experience an intriguing mix of the sultry and the meditative- her body sways and dances as her voice soars and her musical testimonies are as edifying as they are captivating. Etana’s beginnings are humble, but influence greatly her intense passion for music and the sense of maturity and respect with which she approaches her art. With her roots sunk deep in August Town, Jamaica, the home base of Reggae icon, Sizzla, but her feet physically planted in Miami, Florida, after migrating there with her family at only 9 years old, Etana tried to succeed in the heady music business as a member of the all-girl pop group, Gift. It was not until she returned to the source, uncannily to start up an internet café with a friend in the busy Kingston metropolis, that her lifelong dream began to come to fruition. On the sly, that same bredrin initiated her ‘audition’ with Fifth Element Records, an established recording and management company largely responsible for the resurgence of the careers of roots singers Richie Spice and Chuck Fender. Floored by her powerful and sometimes raspy alto voice, the Fifth Element management team immediately asked her to join Richie Spice’s touring party as a backing vocalist. The ensuing fifteen months would see Etana stepping up and out to soak up some of the stage lights, gracing stages in Europe and North America and independently in Africa. Wrong Address, struck a resounding chord with Reggae enthusiasts and still receives heavy radio rotation. Her most recent single Money, released in the summer of 2006, has proved to be a radio friendly hit as well, proving that she is quite deserving of her title as the First Lady of Fifth Element. From Reggae and pop to rock and jazz, her musical influences are varied. And though she is not one to subscribe to labels, Etana describes her brand of music as Reggae Soul- "it is straight from the heart, straight from the soul, straight from the people and everyday life". It is no wonder then that her music is as popular in the streets and in the Dancehall as it is on radio. Expect the release of her debut album, which is still untitled, in the spring of 2007. In the mean time, her third single, Youths, though not officially released, has already begun to enjoy popularity as evidenced from her live performances. Prepare yourself for the "Etana Experience".